Is hip replacement successful in people with 30+ BMI? It has been understood for some time, that obesity increases an individual’s likelihood of suffering from arthritis. To put it in simply, a person with a BMI of 30 or more, is twice as likely to suffer from hip arthritis than someone who has a BMI under 30. Given the worldwide obesity epidemic, there is a great deal of discussion around the topic of obesity and hip replacement. In the UK, some of the trusts of the NHS are denying hip replacement to individuals with a BMI over 35. Were they satisfied with the result of their surgery? Do they get good functional results from their hip replacement? Do they have more complications than non-obese patients? A study of patients from the Specialist Orthopaedic Group practice group in Sydney Australia, looked at hip functionality, post-operative complications and patient satisfaction. The study looked back at 1420 most recently operated patients, who underwent total hip replacement surgery. 1154 of patients were identified as non-obese (with an average BMI of 25), and the other 266 were identified as obese, meaning they had a BMI of 30 or more. (The obese group had a BMI of between 30 and 45 and an average BMI of 34). A matched cohort study was done, which means 82 obese patients were matched up with those who were not obese, but were of the same age (+/- 2yrs), gender, had same diagnosis/reason for having surgery, same type of hip replacement, were operated on the same side (left or right) and had the same surgeon perform their surgery. The study analysed patients’ pre- and post-operative measurements including Harris hip score, joint range of motion, X-ray analysis (to look at implant positioning and stability). Post-operative complications and post-operative satisfaction were also studied. Patients with BMI of 30+ were equally as satisfied with the result of their hip replacement surgery as patients with BMI under 30. 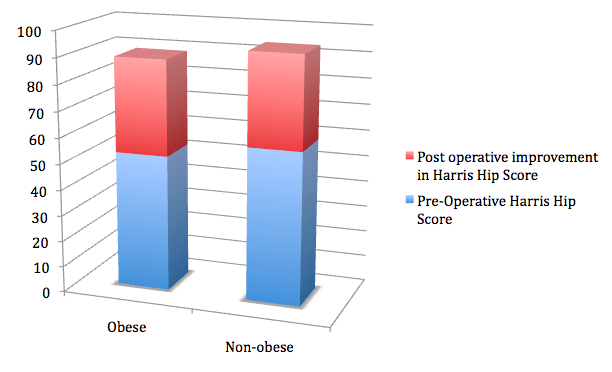 Patients in the obese group gave an average score of 9.38 out of 10 (1 = very dissatisfied and 10 = very satisfied). The average score for the non-obese group was 9.46 (statistically there is no difference between these results). Patients hip functionality improved by the same margin as the slimmer group. Patients with a BMI of 30 or more, showed a very significant improvement in their functional scores (range of motion and ability to perform activities of daily living). Though they started with lower scores and finished with lower scores, the margin of improvement was the same as the slimmer group. Find out more about Harris Hip score and take the online hip score test. There is a widely held view among medical professionals (including Professor Walter), that obese patients must be managed more carefully post-operatively, because they are more likely to suffer from complications due to their obesity. However, this particular study showed there was no statistically noticeable difference in post-operative complications between the two groups we studied. And a final word from Professor Walter on the matter. “There are many good reasons to lose weight, including reducing the risk of getting hip arthritis in the first place, and reducing the pain from early arthritis. However once a large person has moderate to advanced hip arthritis, this study shows clearly that hip replacement is a successful procedure with good results”.